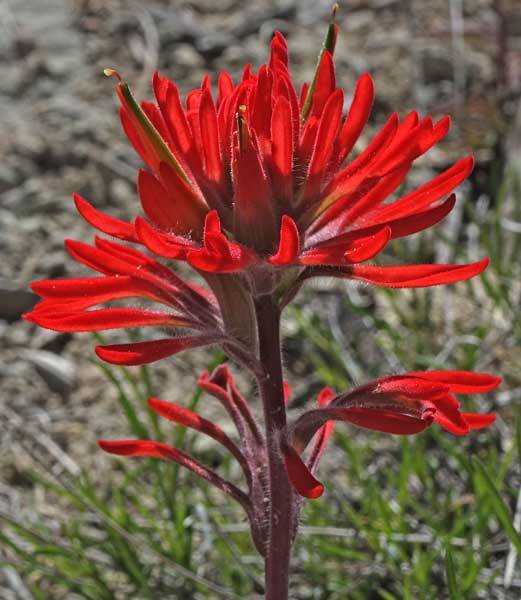 Click to read about the Castilleja genus. Semi-desert, foothills. Canyons, grasslands. Spring. Lower Cross Canyon, Utah, April 10, 2016. Behind the Rocks Wilderness Study Area, Utah, April 23, 2006 and Canyons of the Ancients National Monument, April 18, 2007.
and some bracts, sepals, and leaves are deeply cut into three lobes. The plant often has a light purple tinge to its leaves and bracts. "Chrom" is Greek for "color". 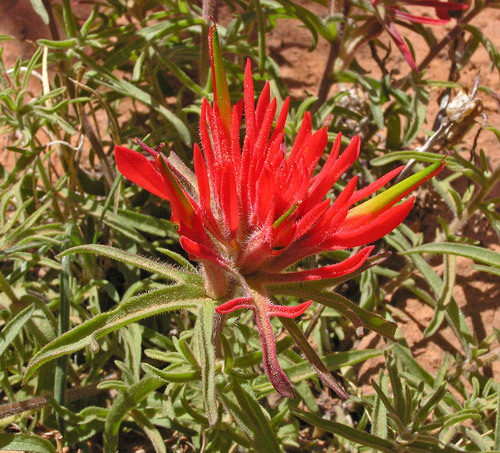 Aven Nelson named this species Castilleja chromosa in 1899 from a specimen he collected in 1898. 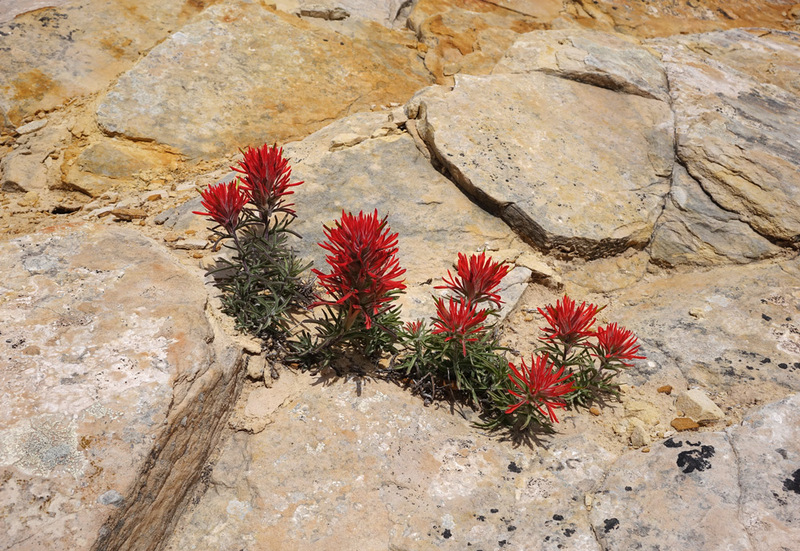 Nelson also named Castilleja angustifolia variety dubia in 1902. 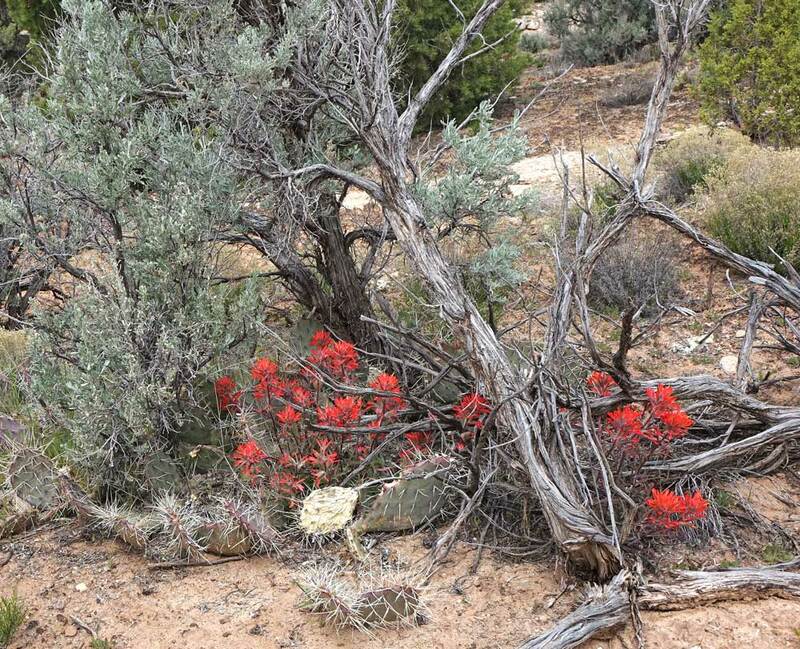 Intermountain Flora observes, "until 1899 [C. chromosa] passed for the little-understood C. angustifolia. The two are closely related and are sometimes difficult to distinguish. If one chose to consider them conspecific [i.e., "the same species"], the name C. angustifolia var. dubia ... is available for C. chromosa". Some modern botanists again maintain that the species shown here is not C. chromosa but is a variety of C. angustifolia. 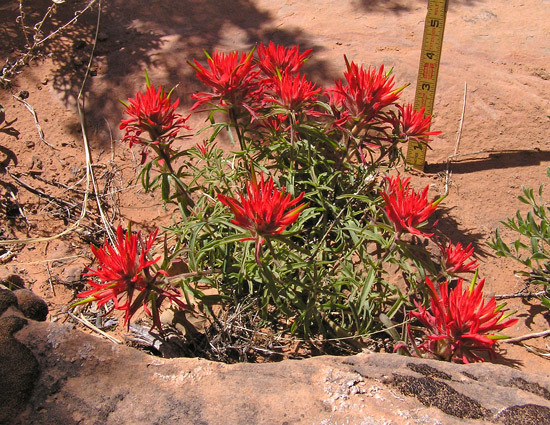 The genus name, "Castilleja", honors Domingo Castillejo (1744-1793), Spanish botanist and Professor of Botany in Cadiz, Spain. 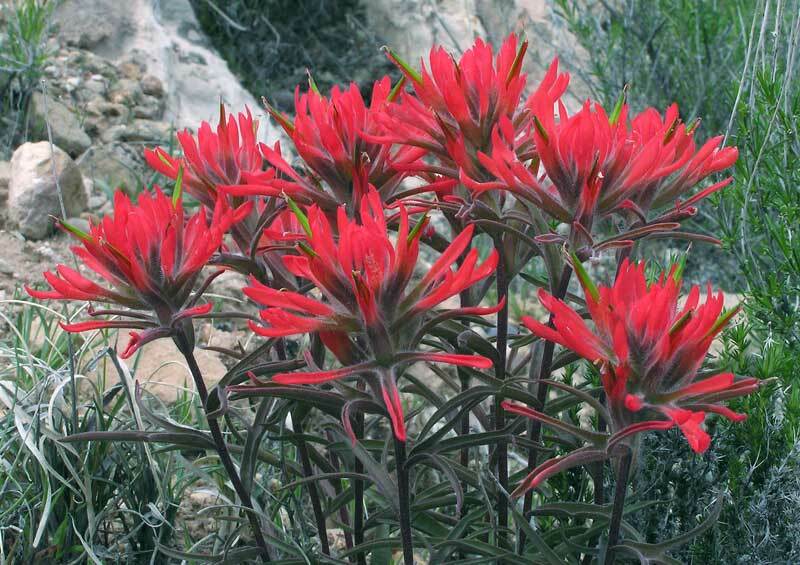 In the late 1770s Jose Celestino Mutis (who was born in Cadiz, Spain but spent most of his life in Columbia) named a new Columbian genus "Castilleja" to honor his countryman. He sent the new species and name to Linnaeus' son who published the information in Supplementum Plantarum in 1781. (More biographical information about Castillejo). 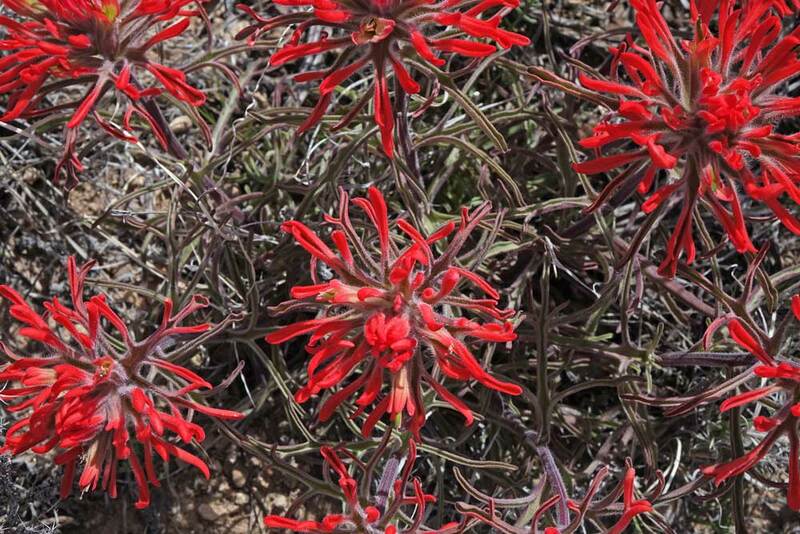 Castilleja chromosa's vivid red color is not the flower color; it is the color of the modified leaves, the "bracts". 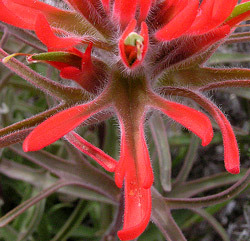 The flowers in Castilleja chromosa (as in all other Castilleja) are actually very inconspicuous narrow, green tubes that can be seen projecting outward in the photograph at left at about 12, 3, 6, and 9 o'clock. 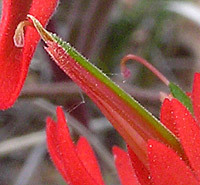 In the photograph below, the curved, hanging, bulbous stigma projects from the green tubular flower.